Per a suggestion from "skidawg1985", we've added a new reader poll (upper right side of page). Who do you think is our top QB in history? I didn't include Trippi or Sinkwich because the modern offensive definition of a quarterback is so much different now than then. Fran Tarkenton - Led UGA to an SEC title in 1959. Became one of the greatest quarterbacks in NFL history. 9 time NFL Pro Bowler and 1975 NFL MVP. Buck Belue - Won a National Title in '80 and two SEC titles. Eric Zeier - One of the most decorated passers in SEC History. Left Georgia as the SEC's All-Time leader in total offense and passing. Completely changed the offensive look of the UGA program with his signing. David Greene - NCAA All-Time Leader in Wins. SEC Championship in 2002. DJ Shockley - Arguably the greatest statistical season or any UGA quarterback in history (2005). Accounted for more TDs than any other Dawg in one season. Matt Stafford - Athletic Gifts with little peer. 17-4 as a starter in two seasons. Who are you voting for? Why? Belue was great at handing the ball off. I'm sure Tarkenton was awesome, but I can't really compare him to today's guys. Shockley was fun to watch, but one year can't establish one as The Best Ever. Finally, I cannot see how anyone can justify voting for Stafford. He's been average at best over his two seasons, and while he has a lot of promise, I'd like to actually see some results before anointing him. This might be the year that happens -- and if it does, I would be thrilled. Average at best? We're being mighty hard on Stafford, aren't we, anon 2:37? He's 17-4 with a Sugar Bowl victory and a #2 finish in his first full season as a starter. That rivals David Greene's first two seasons, which I believe ended 21-5 with a #3 finish and a Sugar Bowl victory. Of course, Greene got the SEC championship, but he also got bailed out in the season opener by another guy on this list: DJ Shockley. If Shockley doesn't come through in that game, who knows what would have happened that season. And, why isn't Ray Goff on this list? I keeed. I keeed. I'll go with Fran Tarkenton... for now. I voted for Tarkenton because it didn't specify parameters against including their professional careers. His bust is in Canton and that's an argument-ending trump card as far as I'm concerned. DJ will however probably always be my favorite. If the forward pass does not factor in, I have to write in Ray Goff. That boy sure could run. It's got to be Zeier. When he had a balanced offensive attack in 1992, Georgia was one of the best teams in the country. Plus he rewrote the record book. While Shockley remains one of my three favorite Bulldogs of all-time, it's hard to rank him as one of the overall greats just because he only had one season to shine. IF we are talking about the *BEST* QB of the bunch no one comes close to ZEIER. Sure Zeier had talent in 92, but...His mechanics, field vision, pin point accuracy and decision making far exceeds David Greenes. My first inclination was Tarkenton then I started thinking to myself: "Self, you're going to put out a fictional football team and you need to pick a QB from this list at their college prime to fill that slot. Who's it gonna be? Who do you feel most comfortable putting under center?" There was only one answer after looking at it that way: Zeier. Dante - if that's the question. I'm taking Shockley. He carried the entire 2005 team on his back to an SEC title. Zeier carried the '93-94 teams on his back. But all he got was about 5 or 6 wins. Bratkowski also lead the world in interceptions. Jimmy Harper, now theres a mans QB. Harper, a longtime SEC offical, led the Dawgs in passing in 1954 (I think)with 450 yards. Yeah J.D. Stokeley was something else. "I'm taking Shockley. He carried the entire 2005 team on his back to an SEC title." pffffffffft. Not true at all. Shockley had a hell of a year, no doubt. But that defense (other than AU & WVU) was dominant. That's a tough poll. I went with Greene since I interpreted the poll strictly as related to college careers. He put up some big numbers sharing time with DJ (and like DJ and MS suffered a lot of dropped passes) and the wins speak for themselves. Having said that I look for big things from Matt Stafford the next two years. He's the most physically gifted QB the Dawgs have ever had. Hopefully the receiving corps will continue to improve. BTW -- Ray Goff was one of the greatest option QB's ever. He could run that veer. 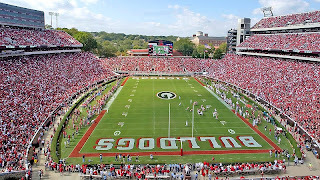 The thing about picking Shockley is you have to consider that the Georgia coaching staff, who hopefully know a lot more about football than you, picked Greene over him for three years. Though I think Shockley could have done about just as well. It is hard to argue against Tarkenton's pro career, and Stafford still has a lot of "upside". If I'd had my druthers though, I would vote for Sinkwich, if only for the fact that his 42 Rose Bowl put Georgia on the map, nationally. I feel it's necessary to give Mike Bobo some props here. I'm not saying he was the greatest QB in Dawgs history but he did lead us to two of our most improbable victories (at Auburn 56-49 in 4OT in '96 and 37-17 over Florida in '97). He also holds the "most consecutive passes completed" record, achieved against Wisconsin in the '98 Outback Bowl. Plus, he is our current OC and in charge of training what we are hoping will be the greatest QB in UGA history. Otherwise, I have to go with Greene right now. It's hard to go against the NCAA leader in wins. Greene and Belue were a lot alike. They didn't do stupid things to lose games (see: Quincy Carter, the WORST QB in UGA history). If Zeier played for the current coaching staff, things may have worked out a little better for him. Plus, Zeier's defense let him down a lot (see: at Alabama 29-28 loss). I'm going with Zeier. His stats speak for themselves. He win/loss record was more of a product of poor coaching than it was individual performance. Oh and he was a Heisman finalist. If we're discussing the greatest QB's in UGA history then their NFL career shouldn't be factored in. I voted Zeier because I feel like he is the best QUARTERBACK. His precision passing and ability to break down the defense makes him the best. If Zeier would have played with the same team as Greene and Shockley, he would have boated better numbers. I love all the quarterbacks. I am glad that we are privileged enough to even have a discussion of great quarterbacks at our school. Go Dawgs. I kept Greene out and Shock, while they were both incredible, they weren't capable of Zeier like numbers consistently imo. Dawg19 ... you must be only 19 years old, because Q-Dawg was far from the worst QB in UGA history. Aside from Stafford, Q may have been the most athletically gifted QB to ever set foot in Sanford. He may have been frustrating at times, but Q was a decent QB overall. You probably do not remember the James Jackson, Wayne Johnson, Greg Talley, Preston Jones years. Now that was frustration. I voted for Greene based on his 4 years of work. However, what I really came on here to post is this: THERE CANNOT BE ANY ARGUMENT WHATSOEVER THAT JOHN RAUCH IS THE MOST UNDER-RATED DAWG PLAYER OF ALL TIME. The guy left school as the all-time NCAA passing yardage leader and there are 5 Dawg fans born after 1970 who have any idea who he was. He really deserves to be mentioned as one of THREE great DAWGS of the 40's, along with Sinkwich and Trippi, but he never is. BTW - how about some love for LARRY RAKESTRAW? I am twice that age. But that doesn't matter. Yes, I remember all those guys. Todd Williams comes to mind, too. BUT...I don't remember any of those guys being accused of throwing games or doing drugs while the starting QB at UGA. None of those QB's singlehandedly got a coach fired. What was "Q-dawg's" record against Florida, Tennessee, and Tech? 1-8. That's one win and EIGHT LOSSES. The one win against UT in 2000 came because we discovered a guy named Musa Smith was in our backfield. Your're right...Quincy was VERY athletically talented. But hitting the oppositon in the numbers or fumbling after driving 60 yards is far more frustrating than not moving the ball at all. My last point...in 2000, I was at the home game against Vandy. Quincy was dragged out of bounds by a defender. Quincy was slow to get up. Almost the ENTIRE CROWD began yelling, "STAY DOWN!!" Tell ya what...I'll amend it. He wasn't the worst QB. He was the LEAST POPULAR QB. Wayne Johnson and James Jackson managed to find a way to beat Florida, too. The offense Zeier was running in his day is in no way comparable to the throw-happy offenses we see today. Had Zeier been in one of the shiny spread/gun/west-coast things that are in vogue now, he'd have had a shot at the all-time yardage record. Zeier threw a better ball - deep, touch, mid-range, whatever - than anybody on the list that I've seen* (I'm 30, sue me since I didn't see Tark in the flesh...). Greene might have been a better game manager, Shockley was/is a better athlete than both of them, but Zeier had the 'intangibles' that offensive coordinators dream about. Stafford is really too young for consideration on this list, but i'd also say that so far, he's in a tie for about 4th behind Zeier, Tark, and Greene. If anything this thread has showed us the level of QB talent in Athens since Fran. We're talking about all-time greats who have had barely had a cup of coffee in the NFL, let alone received Heisman consideration. Contrast that with other positions like TE or DT for which Georgia is known. Guys like Greene and Shockley were definitely above-average QBs with results to match, and that makes me really excited to think what a QB with first-round talent and a head to match could do for this program. Do we have that guy in the program now? Quincy played like he was still in high school; thinking he could complete any throw, run for any first down. I'd go with Zeier. if he had what Green or Stafford had to work with his records would still hold. I think Stafford started wearing the new helmet after the KY game, when he go banged up. Didn't the whole season change after that? I think it did. Why isn't Joe Tereshinski on the list? He knows the full playbook. He's poised. He's a leader. And so on. Remember? That's a pretty cheap shot anon 2:11. To tell you the truth I'd love to see Tereshinski on that list. I can't think of another kid who loved Georgia more & fought so hard to help his team. He dreamed of playing ball for the Dawgs and when that didn't work out as he hoped, under intense and oftentimes unneccessarily derogatory criticism, he held himself with the upmost integrity and continued to strive to help his team win. Do you not remember the Florida game when Shockley was injured? That kid gave all he had to help us win. I'll never forget that touchdown pass to him from Thomas Brown. Do you also not remember what he said to Bobo & CMR when they had to tell him he'd lost the starting job to Stafford? I'll be happy to remind you: His first response was "how can I help my team win." Tereshinkski may not have ended his career as the best QB in Georgia lore, but he ended it with class... which is more than I can say for you, quite frankly. So in light of that, my vote goes to Joe T III. where is Andy Johnson on this list? That guy was pretty good, wasnt he? Andy Johnson and Jimmy Poulos are the two guys who hooked me as a Bulldog when I was a kid. I watched that Thanksgiving night game their sophomore year at the Joke by Coke versus the nerds. That last ditch drive for the go-ahead TD with under a minute and a half to go the length of the field with no timeouts impressed me. plus, the guy had a good NFL career as a RB. It was a different offensive era, but he ran his team pretty well. My favorite, Reggie Ball, led the Dawgs to 4 straight over g tech (if he can count that high). As someone noted, I think the defense in 05, was much better than what was on the field in 93-94. Do you remember that LSU game? He was a completion machine. He obviously had some horrible games (see: South Carolina) and some personal issues, but he did have some ability. However, I definitely wouldn't have put him in the top 5. One of the things about some of the older QBs is that some of them split time quite regularly. I am reading a UGA football history book and I am amazed at how many times, 2 QBs played during the big games. Granted, those were more run-based offense, but it was still common in Fran's day. Finally, does Fran get or lose points for "That's Incredible!" he has great athletic ability, and he hasnt even reached his full potential yet! I voted Greene. Because he's hot. After thinking about this all day, I'm revising my vote. With all due respect to Tark, I'm voting for Thomas Brown. 1.000% career completion. Every time he threw it, it was for a TD. Andy Johnson.....You boys don't know much of anything about Georgia football history. For top 3 of the last 30 years I would have to say Zeier, Greene, and Shockley as the top 3. I would have loved to see Shockley start another 2 years. He came in and stepped up. If it wasn't for the injury we could have had a completely different season. 1) Outside of Tarkenton and Ward, no UGA QB has had a meaningful pro career. (Ward played some QB at UGA, but obviously not what he is known for). 2) I neglected Andy Johnson in my original list. I thought about Rauch, but again the different era thing. 3) I was only focused on college careers and not NFL careers. To be honest, I care very little what players do in the NFL. I think it has nothing to do with their college performances and too often when a player with a great college career does not pan out in the NFL it seems to diminish what he did in college. For instance, I really like Eric Couch (I have a soft spot for option QBs despite my leaving Johnson off the list), but his failure to make in the NFL does not hing to diminish his college career. Dare I say the same thing about Florida QBs and our own David Greene. Maybe a poll on the greatest at each position (or group so you can lump all the O-line into one group and D-line into another). I think we can skip the greatest running back poll at least until Knowshon finishes his career---and maybe not then. I took David Greene, his record speaks for itself. He brought us into the next golden age of Georgia Football. Next poll: Best Point Guard in UGA history. That should be an interesting debate. Looks like you edited the article, Paul, but the incomparable John Rauch is clearly the best QB in UGA history....maybe in the entire SEC. Stafford has a good bit of time to prove he even belongs in the conversation.....I expect he will show how much he does starting Aug 31st. I went with Greeney. I hope he gets a breakthrough sometime soon in the NFL. I voted for Eric Zeier. 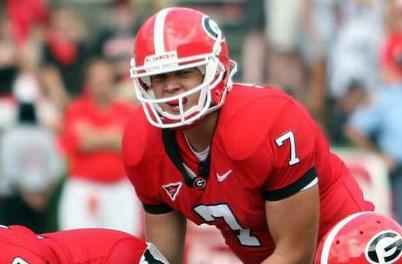 I was in school with Eric Zeier and he was the best I've seen at UGA. IMHO, if he's there during 2002-04 - we win 3 SEC Championships. I did some follow up on Rauch. Wonderful player. I gotta admit I never knew he left college as college football's all time leading passer at 4,000+ yards. One thing I read is he insisted on using OJ Simpson as a blocking back. Sorry, but that is one of the dumbest coaching moves I ever heard of. As for best point guard...Vern Fleming! No other UGA point guard ever took UGA to the Final Four. Olympic gold medal and solid pro career. Also played entire professional career without picking up a technical.